Eight months ago Karen Sutherland of Edible Eden Design opened her incredible urban food garden ‘Gunyah’ with Open Gardens Victoria. If you missed it this year, Karen has just announced she will be opening her garden with OGV again on 4th and 5th March 2017. Karen is passionate about teaching people how to create productive, edible gardens. Keep reading as we share her expert tips for a productive summer garden! Long lasting annuals such as Mizuna, Celery, Silverbeet, 5-Coloured Chard, Perpetual Spinach and Flat Leaf Parsley (that’s a vegetable isn’t it?) all go to seed at the first hint of warm weather, so replace them now if you haven’t already. 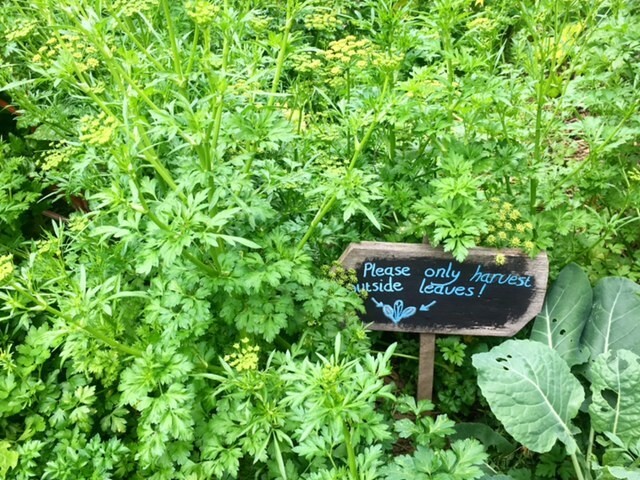 Keep some Parsley plants going by removing the flowering stem so you can keep harvesting these while others supply pollen for beneficial insects and then drop seed to make more Parsley plants. Perennials such as Rhubarb, Red Dock and Lemon Sorrel sometimes flower at this time. Remove flowering stems to keep plants producing more of the stalks and leaves you want. Timing is important in harvesting as well as planting. Asparagus is doing its masculine thing now and it’s also time to harvest and enjoy up till the end of the year, after which you should refrain so the plant can grow and store some energy for next year's harvest. Also wanting to seed at this time are Leafy Lettuces, Rocket and Bok Choy – it’s almost like nature is saying – Eat More Greens Now! If you have the space, use a firm bamboo stake to retain a plant for insect pollen and seed but remember to wait until seed is dry to harvest. Choose a slightly shaded spot to plant new Leafy Lettuces and Rocket now for summer salad and keep them well-watered, to keep them from going to seed. Pick snow peas and broad beans daily to help keep plants producing, but remember that the first really hot days will finish these off. If you haven’t already, get your summer beans and tomatoes in! For a long harvest, plant bush beans for a quick result and climbing beans to produce pods later and longer. When the weather finally warms, sow cucumbers and zucchinis direct where you want them to grow, as these plants don’t like transplanting. You’ll only need a couple of zucchini seed to feed a family, but plant around three to four cucumber seeds per person as the attrition rate of these seedlings is high, although keeping snails off new seedlings will help. This year I’m trying ‘Ray’s Bean’, a type of Borlotti bean that’s suitable for eating later than the usual green pod stage but earlier than dried beans. Bean seeds are harvested when fully grown, fat and green and cooked into protein rich bean dishes without the long soaking and cooking of dried beans. The beans can be frozen after removing from the pods, without the need for blanching first – an easy and tasty source of home-grown protein! I got my seed from Lindy at Island Herbs, who has limited numbers of seeds for sale. I also plan to sell seed of this and my beautiful Delta Louise Snow Pea at the Gunyah Garden opening in March 2017. Suburban gardens can be fruitful all year round with some planning. If your harvest basket is looking a little empty, make plans for next year now! Rhubarb - plant at least one plant per person in the household. Look for varieties such as Ever Red for year round harvest or Giant Victoria for sweet and tasty stalks. Alpine strawberries have small but incredibly tasty fruits produced earlier than their larger cousins. They are a bit slower than normal this year due to cold weather. Strawberries are starting to produce now, so keep them covered with bird netting to make sure you get some. If you’re planting now, put in at least a dozen plants per person in a really sunny spot with rich soil. Citrus – OK you have to be patient and remove flowers and fruit for the first couple of years in colder climates so the roots get well established, but the scent of orange blossom and picking fresh oranges is worth the wait! Mandarins are more upright so well suited to planting along a fence-line. Plant a mix of varieties to ensure a long harvest. Preserved Fruit - make time this summer to pick or source then bottle some stone fruit for enjoying in spring before other fruit appears.